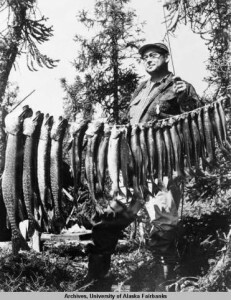 Bud Hagberg with fish caught at Selby Lake, 1960s. Photo by Frank Whaley. UAF-1991-98-1129, Kay J. Kennedy Aviation Photograph Collection, University of Alaska Fairbanks Archives. Or one of the local historical societies that is most closely affiliated with the object’s originating location or subject matter.